One focus of AG Kurzfilm's work is to improve the international representation of German short film. In this area, AG Kurzfilm works very closely with German Films. 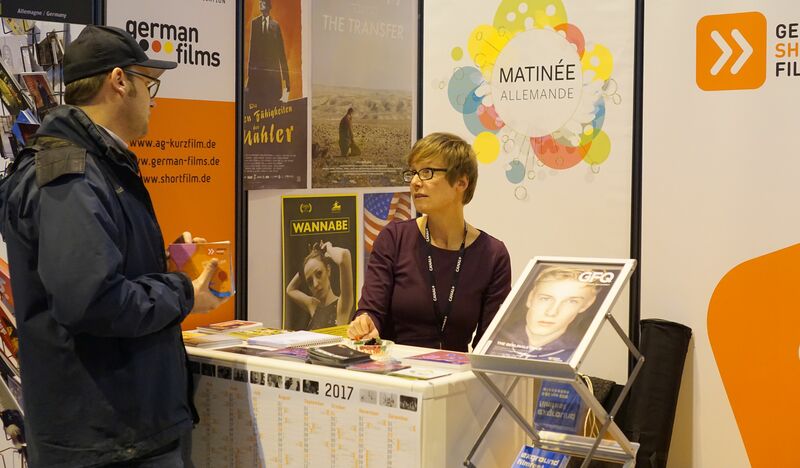 The German Short Film Association represents the interests of German short film on the film markets of the major festivals in Clermont-Ferrand, Berlin, Cannes and Annecy. Every year, the AG Kurzfilm publishes four preview DVDs, which are distributed to industry professionals on these international film markets. Filmmakers who travel to international festivals with the support of AG Kurzfilm also take the DVDs with them and thus ensure the worldwide distribution of AG Kurzfilm materials. This results in numerous enquiries from international festivals inviting films from the DVDs to their competitions or requesting other cooperations. Another important tool for festivals worldwide is the short film catalogue "German Short Films", which is sent free of charge to national and international film institutes, festivals, multipliers as well as cultural institutes, distribution companies, buyers and television stations. It is also presented at film markets, festivals and other important industry events.